Originally published by The New York Times on February 14, 2015. VERBANIA, Italy — Celebrity came late to Emma Morano. Her routine life, in fact, might have raised barely an eyebrow were it not for the fact that she’s managed to hold on to it for so long. 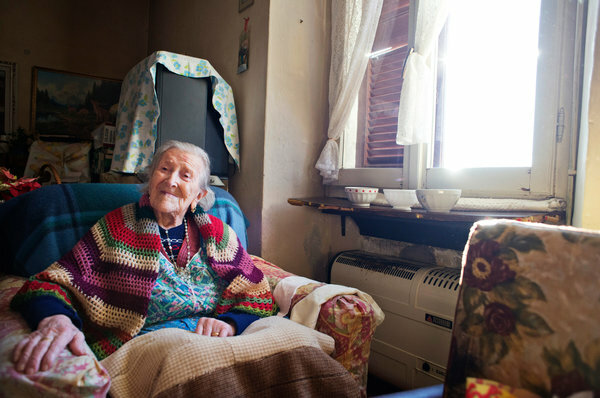 At 115 years and nearly three months, Ms. Morano is the oldest person in Europe, the fifth oldest in the world and one of only a handful of people whose lives have straddled three centuries. In her time, she has watched Italy evolve from a monarchy to a republic that spawned nearly 70 governments in seven decades, with a 20-year foray into Fascism in the middle. She survived two world wars, and the hardship of their aftermath; years of domestic terrorism, and years of economic prosperity that transformed Italy from an agrarian economy to one of the world’s most industrialized nations. Gerontologists agree that there is no one key to longevity. “You talk to 100 centenarians, you get 100 different stories,” said Valter D. Longo, the director of the Longevity Institute at the University of Southern California, whose studies suggest that diet is an important factor in living longer. And there’s genetics. “We do know that the ability to make it to 110 is heritable, so you have a large increase in chance if you have several people in your family to live to a late age,” Dr. Longo said. One of Ms. Morano’s sisters died just short of 100; another lived to 102. Remarkably, Ms. Morano still lives alone, shuffling around a tiny two-room apartment surrounded by dusty memories and the vestiges of her more recent fame, including tributes and certificates from officials, among them the country’s last president, commending her resilience. Next to her bed is a small plaque with the numbers “115” in bright blue letters, made by children at a local nursery school, who hand-delivered the present. “They also brought their coughs and sniffles,” fretted Rosemarie Santoni, her niece and principal caregiver who comes by every morning to prepare the day’s meals, which consist of the aforementioned eggs, now down to two a day, ground meat, soupy pasta and a banana. A neighbor checks in periodically, and is on call for emergencies, but there have not been many. The few times she has been ill, she has “refused to set foot in a hospital,” even having blood transfusions or stitches done at home, said Carlo Bava, the doctor who has cared for her since she turned 90. Her general health is good, he added. Ms. Morano appears to enjoy her new fame, patiently reviving rote reminiscences for the many strangers who call on her to recount her life and the times she lived in. Her memory, however, evades entire decades. Ask her about Mussolini, or the world wars or any number of current or past political figures, and she shrugs indifferently. Her recollections are mostly intimate. “My sisters and I loved to dance and we’d run away to the dance hall and then our mother would come looking for us with a birch stick,” she recalled recently. One of eight children, Ms. Morano was born on Nov. 29, 1899, in Civiasco, a tiny town in Piedmont, in the same year that Guglielmo Marconi first transmitted a radio signal across the English Channel and a group of investors founded the Fabbrica Italiana Automobili Torino, or Fiat. While still a girl she moved with her family to Villadossola, once an important iron and steel company town. The climate — humid and cold winters — was not congenial to her constitution, so a doctor suggested she move to the nearby environs of Lake Maggiore, which straddles Italy and Switzerland. She chose Verbania, a pretty lakeshore town with a milder climate where she found a job in a factory, making jute sacks. Ms. Morano began to gain fame only when she crossed the 110-year-old milestone and entered into the ever-dwindling ranks of supercentenarians, nearly all of whom are women. She is amused to be the object of interest among researchers from around the world, who travel to her bedside — because she no longer leaves her home — to study her lifestyle and genetics. “She’s aware of the privilege of living,” said Dr. Bava, who said Ms. Morano had always graciously accepted the aging process and the aches and pains that come with it. He visits her once a month, just to check in.